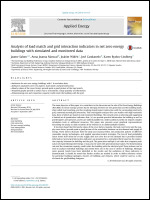 The main objective of this paper is to contribute to the discussion on the role of Net Zero Energy Buildings (Net ZEBs) on future energy systems by the interplay between on-site generation and the building loads, often called load matching, and the resulting import/export interaction with the surrounding electricity grid, commonly named grid interaction. This investigation analyzes five case studies with high resolution data, three of which are based on real monitored buildings. The research aims at selecting and suggesting a limited set of quantitative indicators that: (a) can provide practical information for building as well as grid designers and operators, and (b) are understandable for a wider audience and do not require complex simulation tools or additional resources. This paper also presents novel graphical representations describing the yearly or daily variation of the indexes in an understandable manner. It has been found that the hourly values of the cover factors (namely, the load cover factor and the supply cover factor) provide quite a good picture of the correlation between on-site demand and supply of energy. These factors illustrate both the daily and seasonal effect, the production pattern of different renewable energy technologies, and applied operation/control strategies. The loss-of load probability factor shows how often the on-site supply does not cover the on-site demand but it provides limited information. Several grid interaction indicators are presented in a normalized form based on the connection capacity between the building and the grid. The generation multiple is an index that compares peak values of exported/imported energy; it may also be used with generation/load values. The dimensioning rate and the connection capacity credit relate the building with the electrical grid. These indexes can be used to analyze individual buildings and extend their use in the case of cluster of buildings. Although some general trends have been identified in the results and the usefulness of these indicators is demonstrated, it should be noted that further studies are needed in order to define reference values for particular building topologies, clusters of buildings and climates, which could be used as a rule-of-thumb for grid/building designers. This paper aimed to contribute to the discussion about the role of net zero-energy buildings (ZEBs) or nearly ZEBs in future energy systems, from the perspective of the resulting import/export interaction with the surrounding energy grid (commonly named grid interaction (GI)). This investigation analyses three buildings with measured data at sub-hourly time resolution. The goal of this paper was to quantify the effect of using high-resolution data (one or a few minutes) versus hourly resolution in the GI analysis of buildings with an on-site generation system. A limited set of quantitative GI indicators have been selected: the generation multiple, the dimensioning rate and the connection capacity credit. Additionally, this paper presents graphical representations describing in an intuitive way the yearly or daily variation of the indicators. Some general trends have been identified and the usefulness of the selected indicators is demonstrated. Findings show conclusively that sub-hourly analysis will give more accurate information. Differences between peak values measured with hourly and sub-hourly time resolution can be significant. If detailed GI analysis at the individual building level is required, one should consider going for detailed sub-hourly analysis. A Net Zero Energy Building (Net ZEB) is succinctly described as a grid-connected building that generates as much energy as it uses over a year. The “Net Zero” balance is attained by applying energy conservation and efficiency measures and by incorporating renewable energy systems. 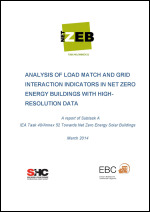 The main objective of this report is to analyze the usefulness and relevance of proposed Load Match and Grid Interaction (LMGI) for Net Zero Energy Buildings. The methodology is based in the analysis of available high-resolution data (mainly hourly) both from simulated and monitored Net ZEBs (Net Zero Energy Buildings) or nZEB (nearly Zero Energy Buildings). The central question is to find a limited set of indicators which provide relevant information to building owners, local grid Distribution System Operators (DSO) when information from building simulations are available at design stage. 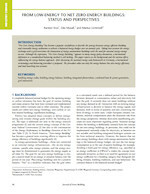 This study aims to investigate the fulfillment of four Net Zero Energy Building (NZEB) balances, NZEB-PE, NZEB-site, NZEB-emission and NZEB-cost, considering the four metrics of primary energy (PE), site energy, CO2-eqemissions and energy cost, respectively, using weighting factors based on Finnish and international reference data. The study analyzes five conventional energy systems and seven biomassbased standalone and shared combined heat and power (CHP) systems. These systems are connected to a single family house located in Helsinki, Finland, with two energy efficiency levels: a standard house and a passive house, simulated by Trnsys software. The annual balance of the import and export of the operational thermal and electrical energies is applied. The simulated results indicate that the NZEB-emission, NZEB-PE, NZEB-cost, and NZEB-site are arranged in that order according to the ease of fulfilling the annual balance. Making the house high in thermal energy efficiency (or adding solar thermal collectors) for all the studied systems is a step towards achieving NZEB-PE, NZEB-cost, and NZEB-site. On the contrary, achieving the NZEB-emission by the shared CHPs connected to the standard house is easier than the passive house. The NZEB balance is more attainable by the shared CHPs than the standalone CHPs. The NZEB-PE is easier to achieve using the international factors than using the Finnish PE factors. In recent years the movement towards more efficient and sustainable buildings has driven the building sector towards the adoption of Net Zero Energy Buildings (Net ZEB) concepts based on the basically zero external energy balance resulting from the renewable energy sources covering a great extent of the building loads. In this framework, the International Energy Agency (IEA) Task 40 / Annex 52 focuses on harmonizing definitions, developing tools, innovative solutions and guidelines related to Net ZEB. Most building energy performance certifications are currently issued on the basis of design input data and several important assumptions (e.g., weather conditions, user behaviors, management of the building) are made and often do not reflect the actual boundary conditions during operation. For this reason, it is necessary to carry out performance assessments during the operation phase on the basis of monitoring data. 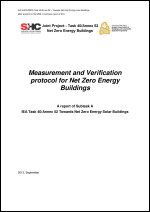 The current document summarizes the Measurement and Verification (M&V) protocol for Net ZEB developed within IEA Task 40/Annex 52 Subtask A. This report assists with the planning, implementation and data evaluation for Net ZEB monitoring. The document is divided in two main parts focusing on energy balance and indoor environmental quality (IEQ) assessment. The monitoring can be used to compare design versus real performance for building energy label verification or as a tool to further improve building performance. However, although the recognition of the cost-effectiveness (Mills and Matthew, 2009) of monitoring for many applications, measurement campaigns are not yet common because of the investment cost and the effort required during the different phases. A standardization of monitoring procedures will reduce the effort required in monitoring activities and therefore facilitate the diffusion. The purpose of defining a monitoring procedure to check the Net ZEB definition has one of the main goal to calculate the balance associated with the Net ZEB definition. Today a number of buildings exist for which the design principle has been to achieve a Zero Energy Building (ZEB) or Net Zero Energy Building (Net ZEB) [1-6]. This paper focuses on Net ZEBs. In Net ZEB definitions, there may or may not be a maximum limit on energy demand. The requirements are generally that the demand is covered by renewable energy sources and that the building is in compliance with the national standards and regulations. However, to meet the goal, a low demand gives an advantage. The general approach to reach Net ZEB could be described as a two-step concept. The first step is to reduce the energy demand by applying energy efficiency measures. The second step is to supply energy, generated by renewable sources, which may be supplied into an external grid when favourable [8-11]. In previous years we have seen a recognition of the significant potential that exists for reducing energy use through innovation in residential buildings. This study investigates innovation challenges and identifies opportunities that could lead to a rapid increase in the adoption of highly energy-efficient housing concepts, particularly that of the passive house. To this end, it exemplifies, interprets and develops the innovation adoption theory through an investigation of views and experiences on the supply side, the demand side and the policy side. It highlights successful innovation trajectories and barriers experienced by businesses. It addresses both problems and positive experiences from the perspective of the end user and investigates different policy approaches. As such, the research reveals important features of innovation-adoption strategies in the building sector. It shows how multi-player enterprise collaboration plays a key role, and the study also recommends the development of quality assurance schemes. It makes a valuable contribution to discussions about how active a role government policymakers and enterprise networks should play. 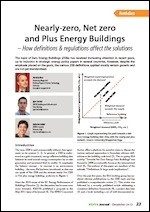 The topic of Zero Energy Buildings (ZEBs) has received increasing attention in recent years, up to inclusion in strategic energy policy papers in several countries. However, despite the emphasis placed on the goals, the various ZEB definitions applied mostly remain generic and are not yet standardised. Results of this literature review are presented in two parts. First part presents key publications that significantly contribute to the discussion on ZEB definitions, and finally the discussion itself. In the second part, Appendix, the ZEB definitions from the literature are divided into the groups in order to give the reader an overview of the wide variety of ZEB definitions. Net zero energy building: A review of current definitions and definition development in Belgium. The recast of the European Performance of Buildings Directive (EPBD) requires the uptake of a definition of so called ‘nearly zero energy’ buildings (nZEB). Belgium was first to set a definition for a ‘net zero energy house’ (NZEB) in 2009. Every year the definition is revised for consistency with shortcomings and emerging issues. The Belgian definition raised many questions regarding (1) the net balance, (2) the application and calculation method (3) the indoor air quality and comfort, (4) energy use included in the balance, (5) the type of buildings, (6) the accepted renewable energy supply options, (7) the quality assurance and monitoring and (8) energy storage and the connection to the energy infrastructure. Therefore, the paper presents a review on the current Belgian definition and its market status in comparison with the international context. The aim of the paper is to review current definition discussions and pave the way to a more consistent definition. The recast of the European Performance of Buildings Directive (EPBD) requires all new buildings to be “nearly zero energy’ buildings (nZEB) by 2020, including existing buildings undergoing major renovations. Belgium was first to set a definition for a ‘net zero energy house’ (NZEB) in 2009. Every year the definition is revised for consistency with shortcomings and emerging issues. However, to reach the nZEB objective many questions are raised in the Belgian context. Many uncertainties exist among local governments and municipalities to achieve that objective. Therefore, the paper presents a review on the current Belgian definition and its market status in comparison with the international context. The paper builds on existing experience with the implementation of the EPB calculation method and the Passive House initiative. The aim of the paper is to review current definition discussions and pave the way to a more consistent definition. Finally, four principles are suggested to reach the nZEB objectives in Belgium. The term Net ZEB, Net Zero Energy Building, indicates a building connected to the energy grids. It is recognized that the sole satisfaction of an annual balance is not sufficient to fully characterize Net ZEBs and the interaction between buildings and energy grids need to be addressed. It is also recognized that different definitions are possible, in accordance with a country’s political targets and specific conditions. This paper presents a consistent framework for setting Net ZEB definitions. Evaluation of the criteria in the definition framework and selection of the related options becomes a methodology to set Net ZEB definitions in a systematic way. The balance concept is central in the definition framework and two major types of balance are identified, namely the import/export balance and the load/generation balance. As compromise between the two a simplified monthly net balance is also described. Concerning the temporal energy match, two major characteristics are described to reflect a Net ZEB’s ability to match its own load by on-site generation and to work beneficially with respect to the needs of the local grids. Possible indicators are presented and the concept of grid interaction flexibility is introduced as a desirable target in the building energy design. The recast of the European Performance of Buildings Directive (EPBD) requires the uptake of a definition of so called ‘nearly zero energy’ buildings (nZEBs). The Belgian Monarch is one of the first countries that set a definition for a ‘net zero energy house’ (NZEB) in 2009. However, this definition is not cast in stone. Every year the definition is revised for consistency with shortcomings and emerging issues. In fact, the Belgian definition raised many questions regarding (1) the net balance, (2) the application and calculation method (3) the indoor air quality and comfort, (4) energy use included in the balance, (5) the type of buildings, (6) the accepted renewable energy supply options, (7) the quality assurance and monitoring and (8) energy storage and the connection to the energy infrastructure. Therefore, the paper presents a review on the current Belgian definition and its market status in comparison with the international context. The aim of the paper is to review the current definition and proposes a more consistent definition. Although several alternative definitions exist, a Net-Zero Energy Building (Net ZEB) can be succinctly described as a grid-connected building that generates as much energy as it uses over a year. The “net-zero” balance is attained by applying energy conservation and efficiency measures and by incorporating renewable energy systems. While based on annual balances, a complete description of a Net ZEB requires examining the system at smaller time-scales. This assessment should address: (a) the relationship between power generation and building loads and (b) the resulting interaction with the power grid. This paper presents and categorizes quantitative indicators suitable to describe both aspects of the building’s performance. These indicators, named LMGI - Load Matching and Grid Interaction indicators, are easily quantifiable and could complement the output variables of existing building simulation tools. The indicators and examples presented here deal only with electric generation and loads. “Net Zero-Energy Building” has become a popular catchphrase to describe the synergy between energy-efficient building and renewable energy utilisation to achieve a balanced energy budget over an annual cycle. Taking into account the energy exchange with a grid overcomes the limitations of energy-autonomous buildings with the need for seasonal energy storage on-site. Although the expression, “Net Zero-Energy Building,” appears in many energy policy documents, a harmonised definition or a standardised balancing method is still lacking. This paper reports on the background and the various effects influencing the energy balance approach. After discussing the national energy code framework in Germany, a harmonised terminology and balancing procedure is proposed. The procedure takes not only the energy balance but also energy efficiency and load matching into account. The concept of Zero Energy Building (ZEB) has gained wide international attention during last few years and is now seen as the future target for the design of buildings. However, before being fully implemented in the national building codes and international standards, the ZEB concept requires clear and consis- tent definition and a commonly agreed energy calculation methodology. The most important issues that should be given special attention before developing anewZEB definition are: (1) the metric of the balance, (2) the balancing period, (3) the type of energy use included in the balance, (4) the type of energy balance, (5) the accepted renewable energy supply options, (6) the connection to the energy infrastructure and (7) the requirements for the energy efficiency, the indoor climate and in case of gird connected ZEB for the building–grid interaction. This paper focuses on the review of the most of the existing ZEB definitions and the various approaches towards possible ZEB calculation methodologies. It presents and discusses possible answers to the abovementioned issues in order to facilitate the development of a consistent ZEB definition and a robust energy calculation methodology. Europe expects the housing sector to evolve towards ‘nearly zero-energy’ dwellings. Meanwhile, general terms and research, marketing and legal definitions considering such dwellings have already been introduced. Appraisal of existing definitions is now needed for further policy development. This paper examines what nearly zero-energy terms can be expected to be adopted in Belgium and the Netherlands. The research method uses an interview method based on innovation diffusion theory. The analysis traces the regional adoption trajectory of relevant definitions and examines the opportunities and barriers for the inclusion of existing definitions in regional energy policy. The analysis shows that—whilst international prominence of the terms ‘net zero energy’ and ‘net zero carbon’, in addition to ‘low energy’ and ‘passive house’, is observed—in Belgium and the Netherlands ‘passive house’ and ‘energy neutral’ are preferred. The research findings indicate that the adoption of already existing definitions for nearly zero-energy houses will depend on the region and can prove a very complex process with several conflicting issues. Terms should be clearly defined and used at all political and marketing levels. It is recommended to enhance the relative advantage, demonstrability, visibility and compatibility of favoured definitions by policy initiatives. Conceptually, a Net Zero Energy Building (Net ZEB) is a building with greatly reduced energy needs that are balanced by an equivalent generation of electricity, or other energy carriers, from renewable sources. So far no common agreement exists on a clear and sound definition of Net ZEB, even though the subject is receiving significant attention in many countries. A major advantage of the Net ZEB approach is claimed to be the absence of energy performance indicators, hence avoiding the need to set internationally agreed limits. The idea of a Net Zero Energy Building (NZEB) is understood conceptually, as it is understood that the way a NZEB is defined affects significantly the way it is designed in order to achieve the goal. However, little agreement exists on a common definition that is based on scientific analysis. The term is used commercially without a clear understanding and countries are enacting policies and national targets based on the concept without a clear definition in place. By: K. Voss et. al. Net zero energy use. The goal sounds simple and is presented excessively in variations all over the world. Major advantage of the Net Zero Energy Building (Net ZEB) concept is – on the first look – the absence of energy performance indicators such as kWh/m² with the need to set agreed energy limits and reference areas. This simplicity is a major background for the high political and public acceptance of the wording. In general a conventional building might be called Net ZEB as long as the annual energy needs or the associated carbon emissions are balanced by credits from excess energy feed into the grid. By: J. Bourrelle et .al. The International Energy Agency (IEA), through the Solar Heating and Cooling Programme (SHC) Task 40 and the Energy Conservation in Buildings and Community Systems Programme (ECBCS) Annex 52 , works towards developing a common understanding and setting up the basis for an international definition framework for Net Zero Energy Buildings (NZEBs). The understanding for such buildings and how the NZEB status should be calculated differs in each of the participating country. Within the task activities, the participants surveyed and compared the variables used for calculation and each country’s national calculation methodologies. Zero energy consumption. The goal sounds simple and is presented excessively in variations all over the world. Energy and environmental politics demand zero consumption as a long-term goal, marketing has discovered the concept and first buildings and settlements aiming at balanced energy or emission budgets have been constructed.